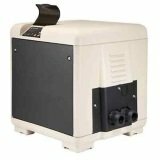 Exploring gas powered Raypak pool heaters and electric heat pumps and its top features that provide superior quality, durability and reliability. When you dive into the pool heaters market, looking for the right gas or electric model for you, the main question is what distinguishes one pool water heater brand from another. In Raypak case it is high-quality materials in proven solutions. 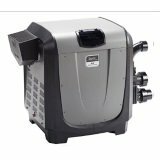 California based manufacturer offers two types of pool heaters to the customers: heat pumps and gas-fired pool heaters (as well as two models of spa/hot tub electric heaters. 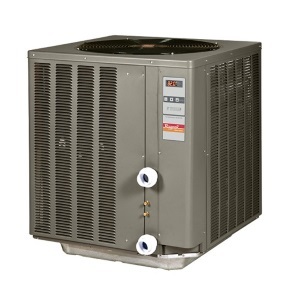 Heat pumps are the most efficient products from Raypak pool heaters. Heat pumps are already dominant in their product range. 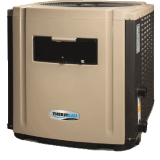 There are two basic and two additional categories of Raypak pool heat pumps and we are going to review them in a nutshell. Some features are common to all Raypak heat pump models. The DuraSteel corrosion resistant housing is polyester powder-coated, and better than plastic one. Heat exchanger with spiral titanium tube is built-in for more power and durability. Units are equipped with direct-set dual thermostat for pool and spa temperature settings and LED diagnostic lights. The most models have remote compatible, modern and convenient digital controls as an option. For the harsh climates, Raypak offer Power Defrost models, which unlike the other heat pumps with defrost features, heating and defrosting at the same time. You will recognize them by the -PD letters at the end of the model name. Raypak pool heaters from Compact series, and its models R2350ti, R3350ti and R4350ti, are designed for above ground pools and smaller in ground pools. The maximum heat outputs are 50K, 66K and 83K BTU, respectively. As an orientation, reviewing the user experience, we can conclude that they are satisfied with 66K BTU heater for 12.000-gallon pool and 83K BTU unit can handle the 16.000-gallon pool if the weather is warm enough. The prices for the compact series model are between $1900 and $2600. Classic series, models R5350ti, R6350ti and R8350ti are more powerful units for larger pools, with maximum 95K, 117K and 133K BTUs. Compared to compact heaters, these models have slightly better coefficient of performance, caused by internal bypass valve. If you need a heat /cool model, look for letters -HC at the end of the model name. The prices of classic series models are between $2950 and $3395, but be ready to add $1000 to the heater price for heat / cool option (April 2017). Quiet series are actually improved classic series, with about the same price range. The R5350ti-QT, R6350ti-QT and R8350ti-QT are designed for climates with salt air. Cabinet and parts are specially protected. The label “quiet” means that units are really quiet for this type of heater with only 59dB of sound. Specialty series are not directly important for homeowners, but worth to know the option exists. Pool heaters are for professionals only. Units are based upon Classic series, with some customizable features to fit the special consumer needs. Residential gas-fired pool heaters come in four models and four identical low NOx alternatives. 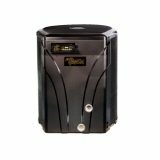 Each Raypak gas water heater has natural gas or propane powered model. Advantages of gas-powered Raypak pool heaters are largely based on used materials, which provide superior durability and performance. Heat exchanger are made from extruded copper or cupro-nickel, burners from stainless steel, and polyester-coated cabinet is not only corrosion protected, it looks nice. Wind resistant design and microprocessor-controlled thermostat are additional pros. 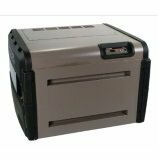 Raypak gas heaters come with digital electronic ignition or millivolt ignition system but not in all states, so be sure that option you want to buy is available. Power and price are rising together, so you have units from 119K BTU to 399K BTU with price of range of $1.140 to $2.330 to choose from (April 2017). Models P-R206A, P-R266A, P-R336A and P-R406A have their low NOx alternatives P-R207A, P-R267A, P-R337A and P-R407A, but only in natural gas options. If you are not sure how much heating power is required for your needs, Raypak offers calculator on their website. Residents of Canada, USA and Mexico may choose heat pump or gas heater option and get recommendation based on their place, pool size and the other factors of influence. Raypak pool heaters are long enough on the market to have number of user ratings. The main pros are durability, ease of use and almost plug and play installation. Many customers use Raypak gas-fired heater for more than 10 years without any problem. If you are planning to use pool heaters regardless of weather conditions and have gas supply as affordable option, Raypak may be your choice. 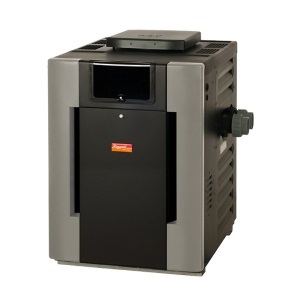 For frequently use of pool heater in warm and moderate climate, consider heat pump pool heater.